Easily one of the most popular sights in Texas, if not the entire country, The Alamo falls on every list of top RV road trips in Texas for good reason. Whether you’re a Texas fanatic, a history buff, a sucker for beautiful architecture, or just love crossing World Heritage Sites off your bucket list, The Alamo is a must-see. This unique mission, built in 1718, is one of the most historic buildings in the American Southwest. It’s particularly significant as the site of the legendary battle for Texan independence from Mexico – the Battle of the Alamo. In fact, the Mission of The Alamo has historical significance beyond this battle. It was the very first mission in the San Antonio area, and it was established by the Spanish government. You’ll learn all this and more when you take a tour of The Alamo, offered 7 days a week. 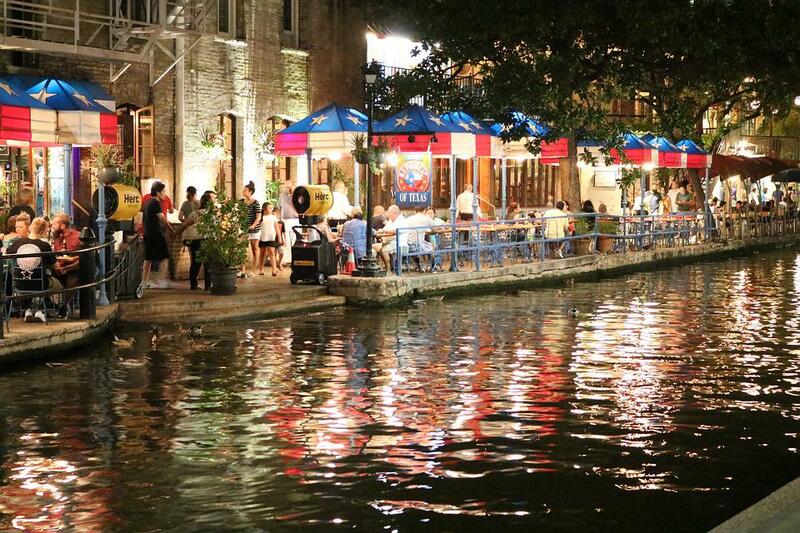 After your time at The Alamo, be sure to check out the other prized sights of San Antonio, the most popular being the city’s San Antonio River Walk. There, you can do guided barge tours or simply stroll along the sidewalks and enjoy great live entertainment, food, and drink. If you’re traveling with the kids in tow, San Antonio is home to a number of fantastic amusement parks. SeaWorld and Six Flags Fiesta Texas are both just a short drive away, as are a number of smaller parks such as the Natural Bridge Wildlife Ranch and Splashtown San Antonio. You’ll find no shortage of things to do in the area, especially if you rent an RV in San Antonio, Texas and go for some scenic drives to nearby state and national parks. You’ll also find dozens upon dozens of campgrounds near The Alamo in Texas. We’ve gone ahead and made a list of the ten best RV Parks and Campgrounds that offer easy and quick access to The Alamo and San Antonio’s historic downtown. Go ahead and take a look! Less than half an hour from The Alamo, Blazing Star RV Resort is close enough to all of San Antonio’s major attractions while being conveniently located outside of the traffic and congestion of the city. The RV resort is on the far west side of San Antonio, just minutes from major amenities like malls, parks, and golf courses. It’s right next door to a Wal-Mart and Starbucks, and SeaWorld is just down the road. During peak season, they even offer free shuttle service to SeaWorld. This is a true resort-style RV park in the heart of San Antonio at an affordable price. It doesn’t get much better than that! The grounds are impeccably clean and perfectly landscaped, and the RV park offers plenty of amenities and activities for the whole family. The pool, kiddie pool, and lounging area are great for cooling off during hot Texas days, and the arcade includes coin-operated games, billiards, ping pong, and more. You can find everything at their general store, but just in case, Wal-Mart is right down the road. This is one of the most highly reviewed RV parks in San Antonio. Located in the far west side of San Antonio, Admiralty RV Resort is just 20 minutes away from the Alamo and most of San Antonio’s attractions. It’s also located on the city bus line, so you can take the bus into downtown San Antonio and directly to The Alamo. Admiralty RV Resort is also right next door to SeaWorld, and they even offer a free shuttle to it. The RV park is also only 20 minutes from the Lackland Air Force Base, River Walk, and Six Flags Fiesta Texas. One of the highest rated RV resorts in Texas, Admiralty RV Resort offers plenty of amenities and conveniences for visitors of all ages. Grounds are very well-maintained and most sites are well-shaded by large, beautiful trees. Their Junior Olympic sized heated pool is great for relaxing and cooling off, and their fitness center has everything you need to stay in shape. With high-speed internet, a business center, and even a recreation room that you can rent out, they’ve got it all. Situated in the San Antonio suburb of Von Ormy, Alamo River RV Resort is just 25 minutes southwest of The Alamo and downtown San Antonio. It’s right on the Medina River, which offers great fishing and recreational opportunities. The massive Ingram Park Mall is just minutes away. Alamo River RV Resort is right off of I-35, just one exit down from the intersection of I-35 and I-410, where you’ll find all the amenities and conveniences you could need. This Veteran-owned and family-operated RV resort is highly rated and a popular spot for visitors to The Alamo and the greater San Antonio area. It’s the perfect place to stay if you’re looking to combine proximity to downtown San Antonio with some outdoor exploration. Its location on the Medina River makes for a beautiful, serene setting where you and your family can enjoy fishing, horseback riding, hiking, and more. The RV park also offers plenty of recreational activities, including basketball, volleyball, and biking trails. Just 10 miles north of downtown San Antonio, Greentree Village North Travel Park is only a 20-minute drive from The Alamo and close to all area attractions. The RV park is less than a mile off of I-35, so it’s convenient to access and near plenty of amenities. You’ll find a number of parks and recreational areas in the vicinity, including Morgan’s Park, a family-friendly amusement park. Gas stations, supermarkets, and restaurants all sit at the entrance to the RV park. Greentree Village North Travel Park is highly rated for its helpful and friendly staff. This quiet, convenient campground is ideal for folks who want to be near lots of amenities, and their monthly rate is particularly attractive for those who are looking for a basic, reasonably priced place to stay near San Antonio, making it a popular spot for long-term campers. You’ll find this KOA right in the heart of downtown San Antonio, integrated into the Willow Springs Golf Course, AT&T Center, and Salado Creek Greenway. The Alamo is just a 10-minute drive away, and there’s a city bus stop right outside the RV park, so you can use public transportation to get to any major attraction in the area. San Antonio KOA is immediately accessible from I-10, I-35, and I-410, and it’s right next door to Splashtown San Antonio. This KOA is one of the most convenient to downtown San Antonio and is part of a 40-acre, gated park that houses the AT&T Center, a popular golf course, and a beautiful greenway. If you’re looking to maximize your sightseeing in San Antonio, this is the place to be. But if you just want to spend a day relaxing at your campground, you can do that here too. Between their large, resort-style pool, ample green space and biking trails, and fun activities like movie night, tamale dinners, and an annual chili cook-off, there’s plenty to keep the whole family entertained. Only 15 minutes south of The Alamo and downtown San Antonio, Green Lake RV Resort is close to anything you could want to see in San Antonio while being removed enough from the city to enjoy peaceful, quiet surroundings. The RV park is just off of I-37 and a couple miles from I-410, making nearby amenities easy to access. However, it’s also just minutes from Calaveras Lake, a great scenic spot for outdoor recreation. If you want the best of both worlds – being surrounded by scenic nature and minutes from a bustling downtown area – Green Lake RV Resort is the place to be. They offer resort-style amenities at a very reasonable price, including a fully-equipped business center, a beautiful resort-style pool and jacuzzi, a generously sized fitness center, and picnic and grilling areas complete with pavilions and concrete patios. They even offer outdoor recreational activities, including a beautiful, fully-stocked lake for fishing. Right off of I-410, you’ll encounter Yanawana Camp just 15 minutes south of downtown San Antonio and The Alamo. You’ve got the privacy of a rural location with the convenience of being just a mile from gas stations, shops, and fast food. The campground sits along the San Antonio River and a large green space provided by the National Park Service, making it scenic and great for relaxation. This campground is basic but peaceful and lovely, and its priced at a great rate for the area. 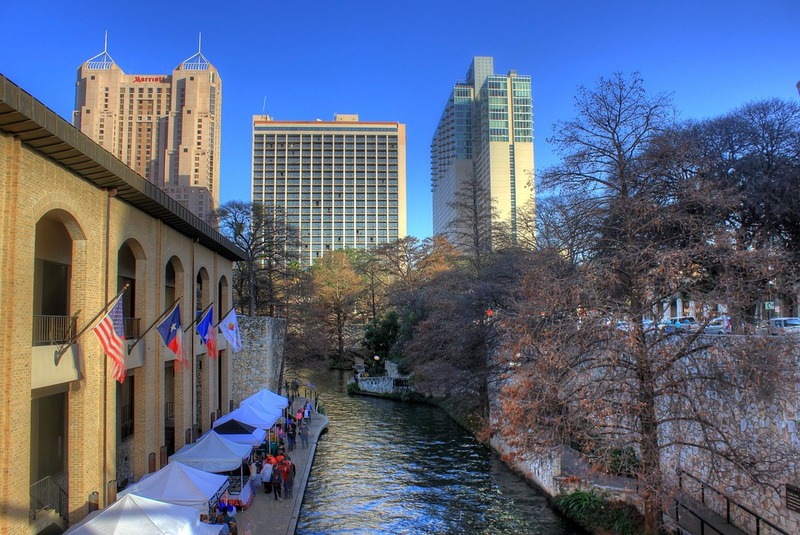 On top of that, it’s very close and convenient to major San Antonio attractions such as the River Walk, the historic downtown, and The Alamo. Camp hosts Gabby and Clemente are highly reviewed for their hospitality and friendliness. Plus, you can’t beat the sunsets here! Traveler’s World RV Resort is just 12 minutes south of downtown San Antonio on I-37, making it easily accessible. It sits along the scenic banks of the San Antonio River, right next to a large golf course and the San Antonio Missions National Historical Park. Just minutes away, you’ll also find a large shopping center, the Walmart Supercenter, and a number of different restaurants. If you’re up for the perfect Texas vacation, look no further. Traveler’s World RV Resort offers everything you need for an enjoyable and relaxing stay, from a pool and jacuzzi to billiards and poker night to fitness classes, potlucks, and even group outings. The scenic park also provides great views of the San Antonio River and walking trails for those who like to explore. The adjacent Mission Riverwalk is a great place to go for a stroll with the whole family, and even your dog. Located in a rural, scenic area, Eagle Ford Estates RV Park offers peace and quiet while still only being a 30-minute drive from The Alamo. There’s not a lot in the immediate vicinity, but a few minutes’ drive will take you to I-37 and plenty of amenities. This rural, family-owned RV park is known for having the largest lots and the fastest internet, and it’s covered in big trees that provide ample shade from the hot Texas sun. If you’re looking to get a sense of the real, laid-back Texas countryside, this is the place to do it. While the campground is close enough to all there is to do and see in San Antonio, it offers immediate access to the great outdoors – here, you can go kayaking, fishing, hiking, and more. A quick 20-minute drive up I-35 will take you from Hidden Valley RV Park to The Alamo, the San Antonio River Walk, and more. Only a mile from the intersection of I-35 and I-410, Hidden Valley RV Park is right next to a Love’s Travel Shop, a Pilot Travel Center, and a number of restaurants and bars. It’s also just minutes from the suburb of San Antonio, where you’ll find a wider range of shopping and dining options. This no-frills, country style camping RV park is all Texas. Their amenities might be basic, but they make up for it in hospitality and value. Plus, they have everything you need for a comfortable stay. You’re also surrounded by quiet, rural scenery and great walking trails. You might not be spending a lot of time here, though, because Hidden Valley RV Park is less than 30 minutes away from everything to do and see in the city of San Antonio. And there’s a lot to do and see! Whether you’re looking for country livin’ and authentic Texas and resort-style camping with state-of-the-art amenities, this list offers a little bit of everything. The best part is that all of these RV resorts and campgrounds are less than 30 minutes away from The Alamo, and many of them are under 10 minutes away or offer public transportation and shuttles. With all of these options, it’s easy to have a fun and relaxed RV trip to The Alamo.